Simplicity Creative Corp. 70-73543 - Baby hugs birth record kit includes 1 set of 100% cotton cross stitch threads, 1 stitching needle, 1 14 count ivory Aida, 1 easy-to-follow instructions. Completed baby hugs savannah birth Record counted cross stitch kit measures 12" L x 12" W. Stitch a one-of-a-kind gender neutral nursery decoration with this colorful safari animal birth record kit! Customize this safari animal cross stitch kit with baby's name, birthday, and birth weight using the included alphabet chart! Featuring a collection of cute baby safari animals, needle, this adorable baby gift for new parents is sure to be cherished for years to come! Includes presorted cotton cross stitch thread, 14 count ivory aida, and easy to follow instructions. Dimensions 70-73543 Baby Hugs Savannah Birth Record Counted Cross Stitch Kit - . When you've finished stitching this DIY baby animal birth record, hang it in your safari themed nursery! 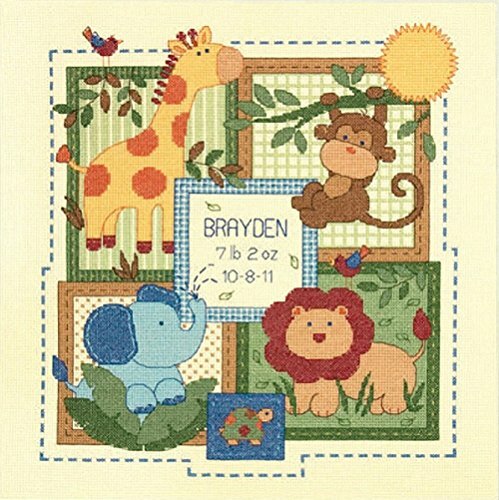 Celebrate a new baby with the dimensions safari Animal Birth Record Counted Cross Stitch Kit! This counted cross stitch kit is easy to personalize with baby's name, birthday, and birth weight. Dimensions Counted Cross Stitch Kit Baby Express Birth Record Personalized Baby Gift, 14 Count White Aida, 12" x 9"
EKS D73428 - This whimsical cross stitch pattern features a colorful train full of cute animals with room to stitch the baby's name, birthday, and birth weight! . Baby express birth record cross stitch kit includes presorted cotton thread, 14 count white Aida, needle, and easy to follow instructions with alphabet for personalization. Completed baby express birth record cross stitch pattern measures 12'' x 9''. A unique gift for new parents, this colorful personalized cross stitch kit creates a lovely keepsake or animal themed nursery decoration! All aboard! this baby cross stitch kit will look adorable in any animal themed nursery! Completed birth record measures 12'' x 9''. Dimensions Counted Cross Stitch Kit Baby Express Birth Record Personalized Baby Gift, 14 Count White Aida, 12" x 9" - Featuring adorable animals in a colorful train, 14 count white Aida, this unique gift for new parents is sure to be cherished for years to come! Includes presorted cotton thread, needle, and easy to follow instructions. Celebrate a new baby with the dimensions baby Express Birth Record Personalized Cross Stitch Kit! This counted cross stitch kit is easy to personalize with baby's name, birthday, and birth weight. Dimensions Counted Cross Stitch Kit Baby Drawers Birth Record Personalized Baby Gift, 14 Count White Aida, 9" x 12"
Dimensions Counted Cross Stitch Kit Zoo Alphabet Baby Birth Record Personalized Baby Gift, 14 Count White Aida, 12" x 9"
Dimensions Stamped Cross Stitch 'Baby Express' DIY Baby Quilt, 34" x 43"
EKS 423601 - Baby drawers cross stitch birth record kit includes presorted cotton thread, 14 count white Aida, needle, and easy to follow instructions with alphabet for personalization. Completed baby drawers birth record cross stitch pattern measures 9'' x 12''. A unique gift for new parents, this colorful personalized cross stitch kit creates a beautiful keepsake and nursery decoration! This adorable cross stitch pattern features colorful drawers full of cute stuffed animals with room to stitch baby's name, birthday, and birth weight! Featuring colorful drawers full of cute stuffed animals, this unique gift for new parents is sure to be cherished for years to come! Includes presorted cotton thread, 14 count white aida, needle, and easy to follow instructions with alphabet for personalization. Dimensions Counted Cross Stitch Kit Baby Drawers Birth Record Personalized Baby Gift, 14 Count White Aida, 9" x 12" - Full of fun colors and cuddly animals, this baby cross stitch kit will look great in any nursery and makes a great baby shower gift! This whimsical cross stitch pattern features a colorful train full of cute animals with room to stitch the baby's name, birthday, and birth weight! Baby express birth record cross stitch kit includes presorted cotton thread, 14 count white Aida, needle, and easy to follow instructions with alphabet for personalization. Completed baby express birth record cross stitch pattern measures 12'' x 9''. A unique gift for new parents, this colorful personalized cross stitch kit creates a lovely keepsake or animal themed nursery decoration! Celebrate a new baby with the dimensions baby Drawers Birth Record Personalized Cross Stitch Kit! This counted cross stitch kit is easy to personalize with baby's name, birthday, and birth weight. Dimensions Counted Cross Stitch Kit, Baby Blocks and Teddy Bear Birth Record Personalized Baby Gift, 14 Count White Aida, 5" x 7"
Simplicity Creative Corp. D70-73560 - Celebrate a new baby with the dimensions barn Babies Birth Record Counted Cross Stitch [email protected] This counted cross stitch kit is easy to personalize with baby's name, birth weight, and birthday. Customize this easy cross stitch kit with baby's name, birth weight, and birthday using the included cross stitch alphabet chart! This whimsical cross stitch pattern features a colorful train full of cute animals with room to stitch the baby's name, birthday, and birth weight! This cute barn animal pattern will look adorable hanging in any gender neutral nursery! Baby drawers cross stitch birth record kit includes presorted cotton thread, 14 count white Aida, needle, and easy to follow instructions with alphabet for personalization. Dimensions Barn Babies Birth Record Counted Cross Stitch Kit, Baby Shower Gift, 12” x 12” - Completed baby drawers birth record cross stitch pattern measures 9'' x 12''. A unique gift for new parents, this colorful personalized cross stitch kit creates a beautiful keepsake and nursery decoration! Baby express birth record cross stitch kit includes presorted cotton thread, 14 count white Aida, needle, and easy to follow instructions with alphabet for personalization. Completed baby express birth record cross stitch pattern measures 12'' x 9''. A unique gift for new parents, this colorful personalized cross stitch kit creates a lovely keepsake or animal themed nursery decoration! Barn babies birth record kit includes 1 set of 100% cotton cross stitch threads, 1 14 count white Aida, 1 stitching needle, 1 easy-to-follow instructions. Completed barn babies birth Record counted cross stitch kit measures 12" L x 12" W.
EKS 3729 - Kit contains cotton embroidery thread, thread palette, 14-count white Aida, needle and easy instructions including alphabet and number chart for personalizing. Finished design measures 16'' W x 9'' H. This adorable cross stitch pattern features colorful drawers full of cute stuffed animals with room to stitch baby's name, birthday, and birth weight! Featuring a child's toys lined on a shelf with space to personalize your child's name, thread palette, this unique gift for new parents is sure to be cherished for years to come! Includes cotton embroidery thread, 14-count white Aida, needle and easy instructions including alphabet and number chart for personalizing. Dimensions Counted Cross Stitch Kit, Toy Shelf Baby Birth Record Personalized Baby Shower Gift, 14 Count White Aida, 16'' W x 9'' H - Celebrate a new addition to the family with our Toy Shelf Birth Record Counted Cross Stitch Kit! This counted cross stitch embroidery kit is easy to personalize with baby's name and birthday. Easy cross stitch kit pictures a child's toys lined on a shelf with space to personalize your child's name. Toy shelf cross stitch activity is perfect for beginners with easy-to-follow instructions. Counted cross stitch kit makes a great gift for soon-to-be parents! This cute barn animal pattern will look adorable hanging in any gender neutral nursery! All aboard! this baby cross stitch kit will look adorable in any animal themed nursery! Barn babies birth record kit includes 1 set of 100% cotton cross stitch threads, 1 stitching needle, 1 14 count white Aida, 1 easy-to-follow instructions. Dimensions Counted Cross Stitch Kit Baby's Friends Birth Record Personalized Baby Gift, 14 Count White Aida, 14" x 8"
Dimensions 'Beach Babies' Counted Cross Stitch Kit, 14 Count Ivory Aida, 14" x 11"
DiMarzio D73472 - Celebrate a new baby with the dimensions zoo Alphabet Birth Record Personalized Cross Stitch Kit! This counted cross stitch kit is easy to personalize with baby's name, birthday, and birth weight. This whimsical cross stitch pattern features a colorful train full of cute animals with room to stitch the baby's name, birthday, and birth weight! This cute barn animal pattern will look adorable hanging in any gender neutral nursery! . This adorable cross stitch pattern features colorful drawers full of cute stuffed animals with room to stitch baby's name, birthday, and birth weight! This whimsical cross stitch pattern features adorable animals, letters, and pretty patterned backgrounds with room to stitch the baby's name, numbers, birthday, and birth weight!. Full of fun colors and smiling animals, this baby cross stitch kit will look fantastic in any animal themed nursery! Easy cross stitch kit pictures a child's toys lined on a shelf with space to personalize your child's name. Toy shelf cross stitch activity is perfect for beginners with easy-to-follow instructions. Dimensions Counted Cross Stitch Kit Zoo Alphabet Baby Birth Record Personalized Baby Gift, 14 Count White Aida, 12" x 9" - Counted cross stitch kit makes a great gift for soon-to-be parents! Kit contains cotton embroidery thread, thread palette, 14-count white Aida, needle and easy instructions including alphabet and number chart for personalizing. Finished design measures 16'' W x 9'' H. Featuring adorable animals, letters, this unique gift for new parents is sure to be cherished for years to come! Includes presorted cotton thread, and pretty patterned backgrounds, numbers, 14 count white Aida, needle, and easy to follow instructions. Dimensions Counted Cross Stitch Kit Safari Animals Baby Birth Record Personalized Baby Gift, 14 Count white Aida, 12" x 9"
EKS D73508 - Easy cross stitch kit pictures a child's toys lined on a shelf with space to personalize your child's name. Toy shelf cross stitch activity is perfect for beginners with easy-to-follow instructions. Counted cross stitch kit makes a great gift for soon-to-be parents! Full of fun colors and smiling animals, this baby cross stitch kit will look great in any animal themed nursery! This cute barn animal pattern will look adorable hanging in any gender neutral nursery! Celebrate a new baby with the dimensions safari Animals Birth Record Personalized Cross Stitch Kit! This counted cross stitch kit is easy to personalize with baby's name, birthday, and birth weight. This whimsical cross stitch pattern features adorable animals, birthday, and pretty patterned backgrounds with room to stitch the baby's name, letters, numbers, and birth weight!. Full of fun colors and smiling animals, this baby cross stitch kit will look fantastic in any animal themed nursery! Full of fun colors and cuddly animals, this baby cross stitch kit will look great in any nursery and makes a great baby shower gift! All aboard! this baby cross stitch kit will look adorable in any animal themed nursery! Dimensions Counted Cross Stitch Kit Safari Animals Baby Birth Record Personalized Baby Gift, 14 Count white Aida, 12" x 9" - This whimsical cross stitch pattern features a colorful collection of safari animals with room to stitch baby's name, birthday, and birth weight! Baby drawers cross stitch birth record kit includes presorted cotton thread, needle, 14 count white Aida, and easy to follow instructions with alphabet for personalization. Completed baby drawers birth record cross stitch pattern measures 9'' x 12''. Dimensions Stamped Cross Stitch 'Baby Animals' DIY Baby Quilt, 34" x 43"
DiMarzio D73049 - Completed cross stitch birth record measures 5'' x 7''. All aboard! this baby cross stitch kit will look adorable in any animal themed nursery! Full of fun colors and smiling animals, this baby cross stitch kit will look great in any animal themed nursery! This whimsical cross stitch pattern features a colorful collection of safari animals with room to stitch baby's name, birthday, and birth weight! Celebrate a new baby with the dimensions baby blocks and teddy bear birth record Personalized Cross Stitch Kit! This counted cross stitch kit is easy to personalize with baby's name, and birthday! Featuring a softy teddy bear and colorful baby blocks, weight, this unique gift for new parents is sure to be cherished for years to come. Customize this easy cross stitch kit with baby's name, birth weight, and birthday using the included cross stitch alphabet chart! Includes 14 count white aida, needle, presorted cotton thread, and easy to follow instructions with alphabet for personalization. Baby blocks cross stitch birth record kit includes 14 count white Aida, needle, presorted cotton thread, and instructions with alphabet for personalization. Dimensions Counted Cross Stitch Kit, Baby Blocks and Teddy Bear Birth Record Personalized Baby Gift, 14 Count White Aida, 5" x 7" - Completed baby blocks birth record cross stitch pattern measures 5'' x 7''. This beautiful birth record square features a soft teddy bear and several baby blocks! Barn babies birth record kit includes 1 set of 100% cotton cross stitch threads, 1 14 count white Aida, 1 stitching needle, 1 easy-to-follow instructions. EKS D73256 - All aboard! this baby cross stitch kit will look adorable in any animal themed nursery! Kit contains cotton embroidery thread, thread palette, 14-count white Aida, needle and easy instructions including alphabet and number chart for personalizing. Finished design measures 16'' W x 9'' H. Zoo alphabet birth record cross stitch kit includes presorted cotton thread, needle, 14 count white Aida, and easy to follow instructions with alphabet for personalization. Completed zoo alphabet birth record cross stitch pattern measures 12'' x 9''. A unique gift for new parents, this colorful personalized cross stitch kit creates a beautiful keepsake or animal themed nursery decoration! Customize this easy cross stitch kit with baby's name, birth weight, and birthday using the included cross stitch alphabet chart! Dimensions Counted Cross Stitch Kit Little Sports Baby Boy Birth Record, 14 Count Ivory Aida, 9" x 12" - Little sports birth record cross stitch kit includes presorted cotton thread, needle, 14 count ivory Aida, and easy to follow instructions with alphabet for personalization. Completed little sports birth record cross stitch pattern measures 12'' x 9''. A unique gift for new parents, this sports theme personalized cross stitch kit creates a lovely keepsake or nursery decoration! Baby express birth record cross stitch kit includes presorted cotton thread, 14 count white Aida, needle, and easy to follow instructions with alphabet for personalization. Completed baby express birth record cross stitch pattern measures 12'' x 9''. A unique gift for new parents, this colorful personalized cross stitch kit creates a lovely keepsake or animal themed nursery decoration! Plaid Inc 45328 - Finished dimensions 10 by 13 inches. Modzoo baby animal birth record kit includes presorted cotton thread, needle, 14 count white Aida, and easy to follow instructions with alphabet for personalization. Completed safari animal birth record cross stitch pattern measures 12'' x 9''. A unique gift for new parents, this adorable personalized cross stitch kit creates a beautiful keepsake or safari themed nursery decoration! This cute barn animal pattern will look adorable hanging in any gender neutral nursery! . Use the included cross stitch alphabet to personalize this nursery decoration with the name, birthday, and birth weight of your baby. Makes a delightful gift for new moms or nursery decoration! Made in the usa baby express birth record cross stitch kit includes presorted cotton thread, 14 count white Aida, needle, and easy to follow instructions with alphabet for personalization. Bucilla Counted Cross Stitch Birth Record Kit, 10 by 13-Inch, 45328 Princess - Completed baby express birth record cross stitch pattern measures 12'' x 9''. A unique gift for new parents, this colorful personalized cross stitch kit creates a lovely keepsake or animal themed nursery decoration! Full of fun colors and cuddly animals, this baby cross stitch kit will look great in any nursery and makes a great baby shower gift! Baby drawers cross stitch birth record kit includes presorted cotton thread, 14 count white Aida, needle, and easy to follow instructions with alphabet for personalization. Completed baby drawers birth record cross stitch pattern measures 9'' x 12''. Simplicity Creative Corp. 50852 - Featuring a happy puppy and playful kitten in a field of flowers and butterflies, presorted cotton thread, needle, this adorable gift for new parents is sure to be cherished for years to come! Includes 14 count white Aida, and easy to follow instructions. Zoo alphabet birth record cross stitch kit includes presorted cotton thread, needle, 14 count white Aida, and easy to follow instructions with alphabet for personalization. Completed zoo alphabet birth record cross stitch pattern measures 12'' x 9''. A unique gift for new parents, this colorful personalized cross stitch kit creates a beautiful keepsake or animal themed nursery decoration! Kit contains cotton embroidery thread, 14-count white Aida, thread palette, needle and easy instructions including alphabet and number chart for personalizing. Finished design measures 16'' W x 9'' H. Counted cross stitch kit. Finished dimensions 10 by 13 inches. This whimsical cross stitch pattern features a colorful train full of cute animals with room to stitch the baby's name, birthday, and birth weight! Use the included cross stitch alphabet to personalize this nursery decoration with the name, birthday, and birth weight of your baby. Dimensions Pet Friend Birth Record Counted Cross Stitch Kit, 12” x 9” - Makes a delightful gift for new moms or nursery decoration! Celebrate a new baby with the dimensions pet friends baby Birth Record Personalized Cross Stitch Kit! This counted cross stitch kit is easy to personalized with baby's name, birthday, and birth weight and includes pink and blue thread for boys or girls. Dimensions Stamped Cross Stitch Kit Baby Animals Birth Record Personalized Baby Gift, 12" x 9"
Dimensions 'Glory of Autumn' Seasonal Counted Cross Stitch Kit, 14 Count Ivory Aida, 14" x 11"